Ross has announced new developments to its line of High Shear Mixers with Solids/Liquid Injection Manifold (SLIM) Technology. Designed for high-speed and high-volume mixing requirements, the SLIM is a unique rotor/stator device capable of injecting powders directly into a fast-moving liquid stream without the need for an eductor or pump. 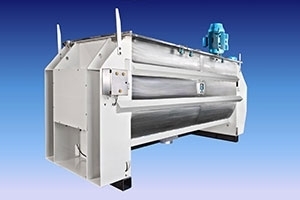 One of the key innovations now being offered is a special hopper that promotes improved flow of various solids for more efficient induction to the mix chamber, according to the company. The hopper features multiple ports to accommodate air pulse devices that would prevent bridging of challenging powders. Another new option is the pneumatically-actuated ball valve for precise modulation of the powder injection rate. The 30HP SLIM Mixers are each equipped with a ported four-blade rotor designed to run up to 1,800 rpm and a stator head with large square holes for maximum pumping capacity. These inline mixers are lubricated by a double mechanical seal system which includes a pressure vessel with sight glass, internal cooling coil and piping. Tri-clamp connections on the liquid inlet, powder inlet and mixture outlet allow for easy disassembly and cleaning. Standard wetted parts are stainless steel 316; for special and heavy-duty applications, the rotor/stator can be boronized for improved wear performance. 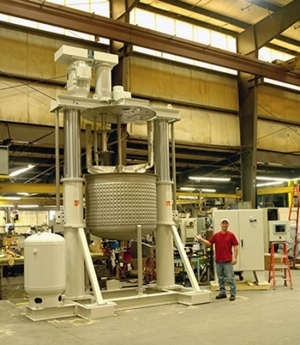 Installed on a portable cart, the inline SLIM Mixer can serve virtually any size vessel located anywhere in the plant.